I want to start by saying the following story is drawn from a pre-print, and the planet Iâ€šÃ„Ã´m about to talk about has not yet been directly detected. This is just a really neat little paper that offers a new way to look at things. In a new pre-print over on arXive, astronomers Ignasi Ribas (ICE/CSIC-IEEC, Spain), Andreu Font-Ribera (ICE/CSIC-IEEC, Spain), and Jean-Philippe Beaulieu (IAP, France) announce they have found what may be the smallest planet yet discovered â€šÃ„Ã¬ a 5 Earth mass world â€šÃ„Ã¬ orbiting a cool red dwarf star. They found this potential new planet through its invisible tug-a-war on an already known gas giant. Hereâ€šÃ„Ã´s how the game is played. Some astronomer (or 2 or 12) adopts a star and observers it over and over and over with a telescope equipped with a high-resolution spectrograph. If they are lucky they find something neat in the light. The following is a long, forgive me Iâ€šÃ„Ã´m a prof, explanation of how astronomers study the light to look for planets using spectrographs. If the star is moving at a constant velocity on its orbit around the galaxy, the lines in the spectra (caused by the emission and absorption of light by atoms) will always be at the same set of wavelengths â€šÃ„Ã¬ a specific set of measurable numeric values. This is easier to imagine if we mentally replace the light spectra with a rich cord sang by a choir being accompanied by a massive orchestra. If you record the sound and look at its acoustic spectra, youâ€šÃ„Ã´ll see specific peaks that correspond to various pitches sung by individual people and instruments. While any sound is possible â€šÃ„Ã¬ weâ€šÃ„Ã´ve all heard the slid whistle slide from high to low â€šÃ„Ã¬ a single cord sung by a specific set of voices will have a very limited set of acoustic peaks. 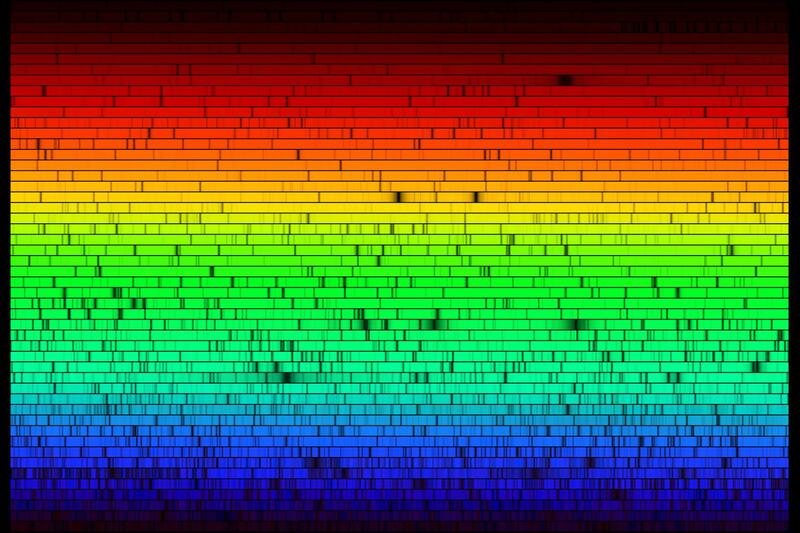 A single star, with a specific set of atoms all humming at the same temperature, will have a specific set of light peaks and valleys in its light spectra. Now imagine that you place that choir on a fire truck that drives straight toward you, misses you by 10 inches, and then tears away. As the fire truck goes from moving toward you to moving away, you hear the pitch go from abnormally high-pitched (soprano) to abnormally low-pitched (bass). In the same way, if you could stick a star on that fire truck without you dieing or it melting, instead of hearing the pitch change you would see the color go from abnormally blue to abnormally red. If a star, on its orbit around the galaxy, has a planet orbiting around it, then it will develop this to and fro 2-step in which it the planetâ€šÃ„Ã´s gravity causes the star to move a little faster and a little slower as the center of mass of the star+planet system moves at a steady velocity around the galaxy. This dance appears as a slight shifting of the starâ€šÃ„Ã´s spectral lines from blue to red and back to blue again â€šÃ„Ã¬ a shift that is a measurable set of numerical values. We call this Doppler Shifting. If a star with a planet with a shift that we can observe is adopted by an astronomer, it is possible to measure the orbital period of the planet by measuring how long it takes to get from blue to red and back to blue again. It is also possible to measure the size of the planet by the size of color shift (a large planet will produce a larger shift in colors). And in some cases, if we are lucky we can observe the planet directly by seeing it pass directly between us and the star, blocking a little bit of the light as it goes (the rest of the time, the orbit of the planet carries it above and below the star instead of in front of it). This is called a transit. If the orbit of the planet changes for any reason, any transits we see will also change â€šÃ„Ã¬ getting longer as the planet passes across the center of the star and getting shorter as the star grazes the planets edges alone, and also changing if the planets orbital shape or size changes. Using computers and complex numerical analysis software, it is possible to take what we see and figure out what it means by moving around digital models of the system until their behavior matches observed behavior. Okay â€šÃ„Ã¬ Iâ€šÃ„Ã´m done with the background. Within the light of a little star named GL 436, astronomers found the characteristic color shifting of a star with a planet. Initial discovery of a 23 Earth mass planet (something a bit bigger than Neptune) occurred in 2004. At that time, astronomers let by Butler (of 51 Peg fame), looked for and could not find any planetary transits. It happens. Itâ€šÃ„Ã´s sad, but hey, sometimes planets arenâ€šÃ„Ã´t as exciting as one would want. What was really cool about this paper, and what lead to me want to write this post â€šÃ„Ã¬ was that their paper made specific predictions about how the observed transits will get longer if the inclination of the gas giant changes by just 0.1 degree â€šÃ„Ã¬ tiny amount that can be somewhat expected. This means, if the 5ish earth mass planet is there, we know what effects it will have on the system in the future. I love science. One group of folks found a planet. Another group found a change in the planetâ€šÃ„Ã´s transit behavior. A third group went ?!?!? and abused some computers to possibly sort it all out and make some predictions. I wouldnâ€šÃ„Ã´t be at all surprised if it was a 4th group who made the follow up observations needed to prove the planet is there. Astronomy is no longer a single man on the mountain science of individuals. Collaboration: itâ€šÃ„Ã´s what all the cool kids are doing. My main reason for commenting, though, was that a fifth group gets busy pouring cold water on the whole thing. And so the scientific process advances. Thanks for the correction. That is what I get for reading the vague text (“…the perturbation from a relatively small planet in a close orbit.”) instead of the very specific table. I’ll correct the post above. Now that is what I call “fine details”! Pamela, blame it on illegal drugs. At one time in the United States, anyone could obtain a post office box without any ID, and illegal drugs could be mailed to them. When the illegal drugs were discovered, nobody knew who actually had that post office box! Most laws today only harm the innocent and law-abiding people, but there is usually a historical reason for those laws. I wish that all laws would have a “sunset clause” and become obsolete after a few years.